Of the 370 community members who voted 25% claimed: "No I haven't tried Speaker Calibration Software - Though, I am keen to try it". These results have been on my mind ever since we announced them back in July 2018, as 25% in my books is a sizeable percentage. 59% Of The Production Expert Community Cannot Live Without Speaker Calibration software In Their Studios - Are You Surprised At This Result? 25% of the voters say they are keen to try a speaker calibration product but have yet to get around to testing a solution in their studio. I suspect the reason why so many have yet to try a speaker calibration product is because all calibration softwares require some sort of measurement microphone in order to set up the process. Maybe the initial spend could be putting people off? I was in that boat years ago. I wanted to try Sonarworks but I was hesitant about buying a measurement microphone in case I ended up not liking the software after testing. Investing in a measurement mic could have a been a waste of money... but it didn't turn out that way at all. In this article we throw the rule book out of the window. We set out to discover if it is possible to get a trustworthy speaker calibration profile without using a recommended measurement microphone. Is it absolutely necessary to buy a measurement microphone if you only intend to demo a speaker calibration software? In this test I find out how different the results are between the recommended Sonarworks measurement microphone and two fairly typical “multipurpose” studio microphones I just so happen to have lying around my studio. 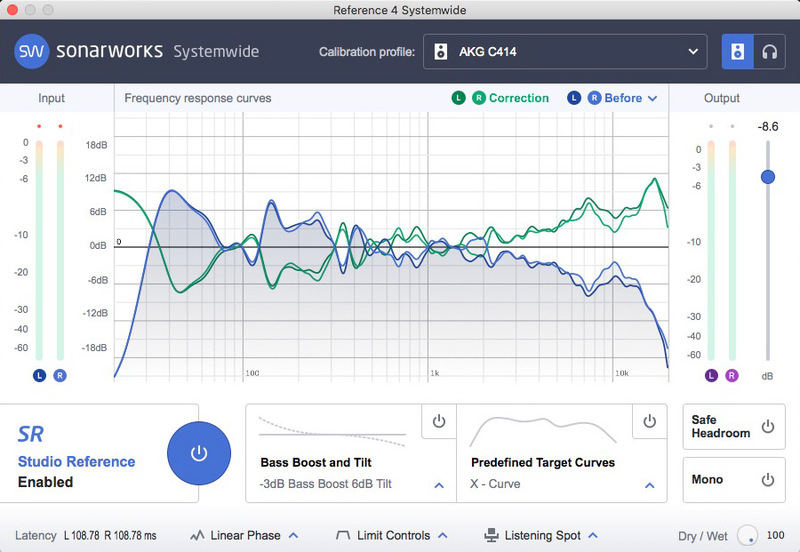 In short, I want to find out if people who have yet to try speaker calibration can truly test the demo version of Sonarworks Reference 4 for free without needing to buy a measurement microphone. Sonarworks strongly recommond we use one of their microphones in order to get the best results from their software. The microphone’s polar pattern is fixed omni. The Sonarworks microphone has a serial number printed on the side which is required within the software before measurements take place. This serial number loads a profile unique to that microphone and the software compensates the differences ensuring we get a flat response. For this test I’m going to use a microphone that I’m very familiar with, my trusted AKG XLS large diaphragm condenser microphone. We are going to set the polar pattern to omni to match the behaviour of the measurement mic as close as possible… even though the AKG doesn’t really do true omni as you can see in the frequency response diagram below. The LA-120 small diaphragm FET condenser is a low cost fixed cardioid pencil microphone and is a mic type that is fairly common in most studios. This cannot mimic the polar pattern of the measurement microphone but we’ve included it as one of the test mics in this experiment to find out how different its results will be compared to the recommended Sonarworks mic. Regular visitors to The Production Expert blog will hopefully have picked up that I’m passionate about Speaker Calibration software. I’ve been using it for nearly three years… I cannot and will not mix without it. For me, Speaker Calibration quickly improved the quality and consistency of my mixes. We know from the poll that Speaker Calibration may not be to everybody’s liking, which is fine, but there is a large percentage of people out their in audio production land who would like to try it but have yet to do so. We believe this could be be down to those individuals feeling reluctant to buy a measurement mic for demoing purposes… which is again totally understandable. If this test shows us that we can achieve results close to what a measurement mic can provide then hopefully the results will inspire those who have yet to test or demo speaker calibration to demo the software using a microphone they already laying around their studio. If the results are close then at least the measurement profile will give you a good impression of what speaker calibration can do for you, your monitoring and your mixes within a speaker calibration software demo period. The first measurement was performed using the Sonarworks microphone. 37 measurements are now required in Reference 4.1 which takes around 15-20 minutes to complete. The second measurement was performed using the AKG C414 in omni with the monitors set at the same level. At first glance the results look totally different… but take a closer look between 20Hz to 2kHz. The differences are not that great between the two microphones in the low to upper mids. We can look at response curves until we’re blue in the face. Switching between the two results in a listening tests is what really matters. The bottom end tightens up in similar ways between the two calibrations, however the top end is noticeably different in the AKG profile, but that was to be expected. This top end though can be adjusted slightly in the software to balance that a bit. The LA-120 did a slightly better job at matching the curve of the measurement mic. It’s a similar sort of results in the low to mid range between 40Hz - 120Hz, although the results from the measurement mic shows a slightly greater bump at around 40Hz. Switching between the LA-120 calibration profile and measurement mic profile the differences are fairly minimal. The AKG calibration was the most different from the measurement mic calibration. To compensate I employed the use of Reference 4’s predefined target curve mode which has a useful Bass Boost & Tilt section. I engaged this to point the correction (marked in green) towards a flatter response which did a pretty job and reducing the highs. Comparing the AKG tilt eq profile and LA-129 profiles against the measurement mic profiles in listening tests proved to me that we can get a fairly good measurement without needing the recommended microphone for speaker calibration. If I had to put a percentage against my findings I would say I got around 75% of the way there in Speaker Calibration setup without a measurement microphone which isn’t bad at all, good enough to use whatever spare microphone you have lying around your studio in order to at least a speaker calibration software. This test was not intended to debunk the usefulness of measurement microphones for speaker calibration setup, I genuinely wanted to find out if it was possible for people not feel as though they have to buy a special measurement microphone for testing or demoing such systems. I’m happy to report from what I’ve discovered in this test that you can just reach for a microphone you already own, set it to omni (if your microphone can be set to that) point, measure, listen and evaluate speaker calibration for free without feeling the need to rush out and buy a microphone built for the job. In the case of Sonarwork, the measurement mic is important as it will provide you with the most accurate results possible, just don’t feel the need to rush out and buy one if you have yet to commit to speaker calibration technology in your studio. 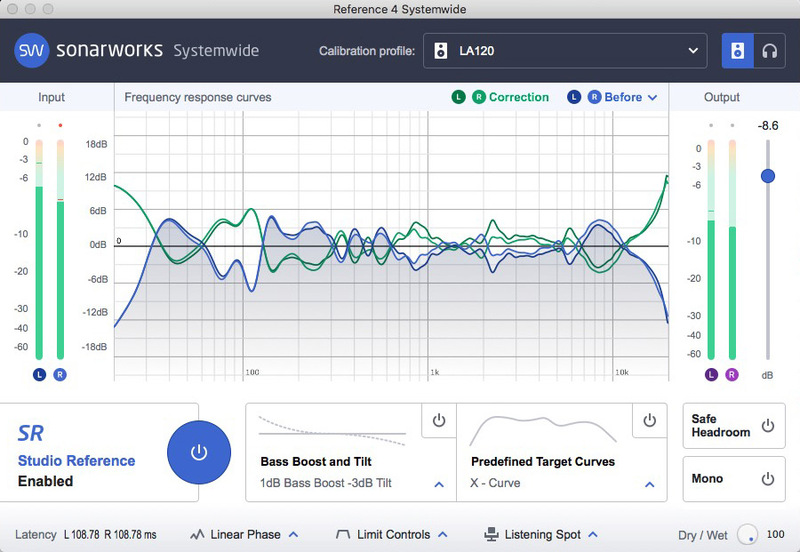 Download the 21 day free trial of Sonarworks Reference 4 to experience speaker calibration in your studio. The DAD SPQ Processing Card Is Now Available - With Pro Mon Does This Make The AX32 The Ultimate Centrepiece For Your Studio?